Y: Bad Bunny ft. Drake, “MIA” – Your Latino lover and Jewish ex dropped a single to quench your thirst. 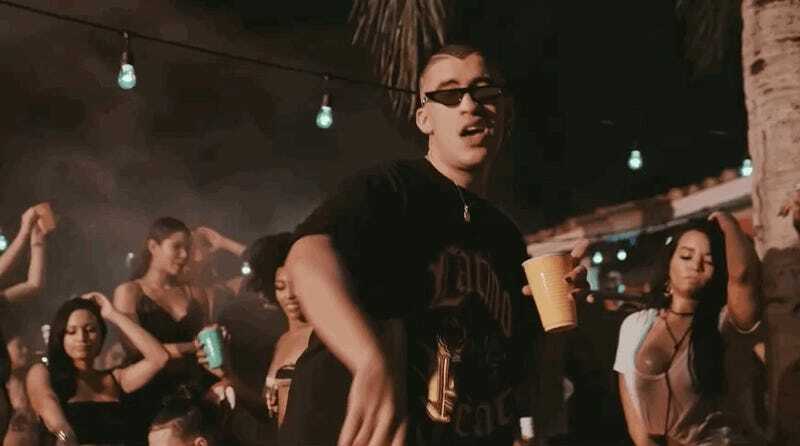 Drake, a rapper that Benito has proudly claimed to stan ever since he was on the come up, is now a ft. (little f) on one of his songs—which bleeds red, white and Bad Bunny. Set in a quintessential Latinx barbacoa in what would appear to be any barrio in Latin America, but is actually Miami (same thing, pretty much), El Conejo Malo takes uncle Drake to play dominoes at his vecina’s house (where every hot woman in the city seems to coincidentally be as well). There are a few things I love about this automatic hit of a video and song. First, the lyrics are entirely in Spanish. This is yet again another example of artists being pushed out of their comfort zone by a new generation of talent that wants to bring the ~Latino Heat~ to an international platform. (Yes, I’m referencing Bad Bunny’s shirt that I so desperately need). Secondly, Drake attempts to add some sazón to his dance moves for the culture. That, and the combination of the three buttons he casually leaves open to expose his hairy chest and Jesus piece, are a hilarious yet satisfying vision. This collaboration is just another example of the width and reach of young Benito’s talent, who has yet to release an album of his own, but consistently tops the charts and stays true to his brand and sound. Known to direct his videos and write his own lyrics in the past, I get the feeling this one is no exception—with Puerto Rico pride bleeding through, and lyrics like “yo soy tu Romeo pero no santo,” that have Twitter losing its cool. Aaaaabsolutely not: Charli XCX & Troye Sivan, “1999" (video) – In a 2014 interview with The New York Times, André 3000 said that “sometimes nostalgia is a cage.” After nearly a decade of mind-numbing, “Remember When? ?” listicles cluttering our feeds, it’s hard to argue with him! That said, I don’t hate Charli XCX and Troye Sivan’s new “1999" video because it’s fueled by nostalgia. I hate it because it’s poorly made. I mean, it’s a three and a half minute montage of retro visual references, but most of those references aren’t even from 1999. Titanic came out in 1997, the Spice Girls’ “Say You’ll Be There” video in 1996, Eminem’s “The Real Slim Shady” video in 2000, the Nokia 3310 in 2000, the iMac G3 in 1998, and The Sims in 2000. Rose McGowan and Marilyn Manson’s infamous VMA red carpet appearance didn’t take place until 1998, and the “dancing baby” animation was made in 1996. Even its Ally McBeal cameo didn’t happen in 1999! That was 1998! ‘98!!!! And TLC’s “Waterfalls” video? That was 1995! What the hell?! “No Scrubs” was right there???? I guess Charli and Troye are showing their age in that respect; she was seven when the “No Scrubs” video came out in 1999, and he was only four. Y: QUISOL ft. Luke Martinez, “The Cards” (video) – Released last Monday for Indigenous People’s Day, QUISOL’s Luke Martinez collaboration “The Cards” is unassuming as it builds, swallowing you up with its rich, layered sound until you almost forget what you were doing before you hit play. QUISOL, a.k.a., 23-year-old Joseph Quisol of Oakland by way of Charlotte and Sacramento, tells Jezebel that “the song is about revolution, love, and freedom,” mixing down-tempo reggaeton beats and light-as-air guitar melodies to craft a sound he’s dubbed “Latinx Future” in past interviews.